Prestwich Clough Day 2012 was a big success for Salford Friendly. The Clough Day is an event put on by Bury Council (see www.prestwichclough.co.uk ) and is a great opportunity for local groups to spread the word to the 3,000 or so event visitors about what they do. 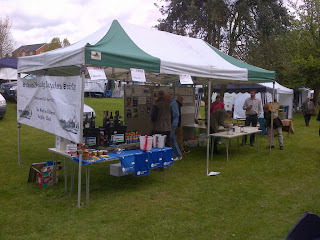 Badger Rescue, Wildlife Trusts, Salford Friendly Anglers fitted in very well between the Bat group, the willow weavers and the Herefordshire Cows. We also use it to raise valuable funds to help finance the running costs of our free to join angling society. At the 2011 event - the heavens opened and visitor numbers were very low - so it was quite a relief to see the sun shining last Sunday morning. 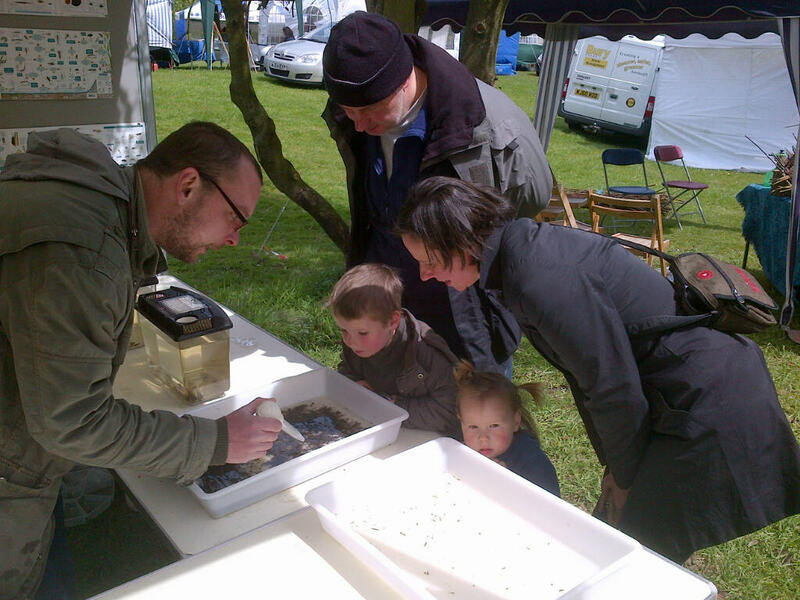 Our marquee gave us an opportunity to put up a display showing visitors the type of activity Salford Friendly engages in, such as pollution monitoring, kick sampling and promoting and providing free fishing. We put on a display of various still water and river fish in tanks, also various invertebrates in trays which people could look at through magnifying glasses and microscopes. But equally important as spreading the word about what we do, was our Tombola stall which gave us the opportunity to raise some ££££ to help finance the work we do. The Environment Agency very kindly donated some bits and pieces of fishing tackle so our Tombola stall was split into two, bottles and general prizes and fishing tackle. 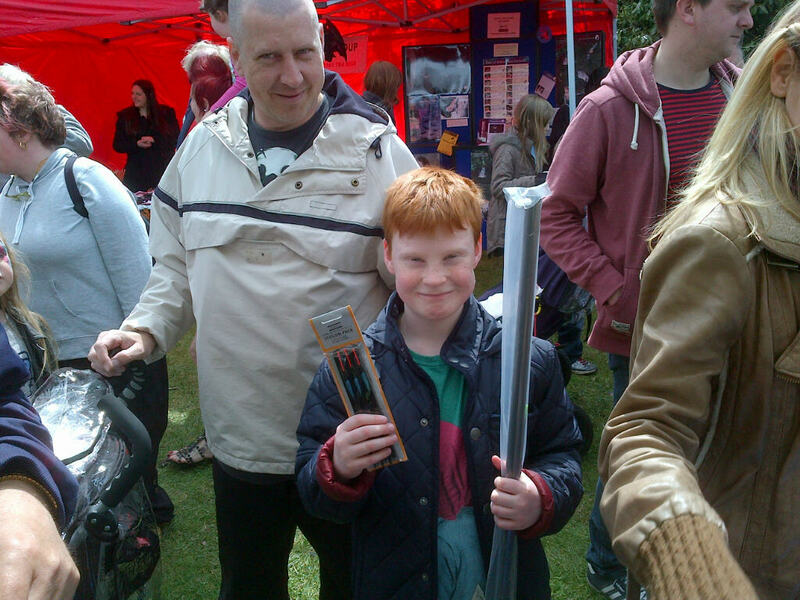 This young lad Kai, was a keen angler and spent a fair amount of his dads cash dipping into our draw bucket - he was rewarded with two whips, a feeder road, floats, disgorgers, rod rests, the only thing he didnt get was a fishing basket. At the end of the day - our Tombola stall was cleaned out - and our volunteers shattered by the volume of people who visited our stall taking a real interest in the fish and invertebrates we had on display. 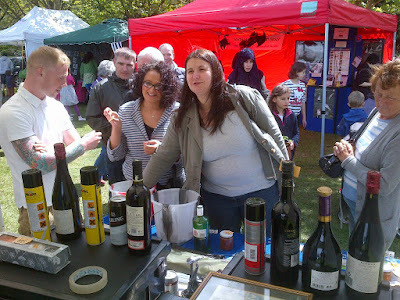 So I'd like to take this opportunity to everyone who kindly donated bottles and prizes for the Tombola stall, thanks to those who have made cash donations over the last few weeks, and many many thanks to the members who gave their time and energy on the day to make the event such a success. We raised a a grand total of £360 - which will cover the lions share of our annual running costs.